Sasha Anderson, a seventh-grader, completed the bracket for a school project. A 12-year-old North Carolina girl who before this year had never filled out a March Madness bracket correctly picked the teams competing in the Final Four. Sasha Anderson, a seventh-grade student, filled out a March Madness bracket for a classroom competition organized by her math teacher at Mountain Island Lake Academy in Charlotte, North Carolina. The teacher, Denzelle Lawson, gave his students eight minutes of class time to fill out their brackets using just the teams’ records and rankings to make their picks. 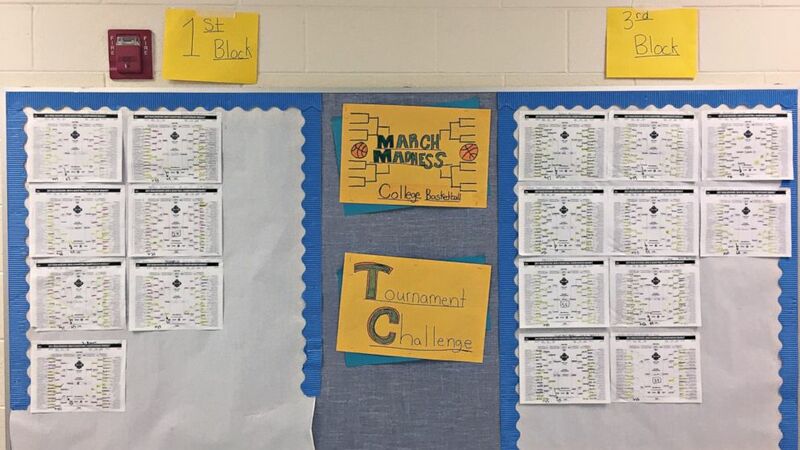 He posted the students’ brackets and the NCAA bracket on bulletin boards outside his classroom. When the University of South Carolina upset Duke on March 19, Lawson realized that only one of the 70 brackets was still in contention to be a perfect bracket. (Denzelle Lawson) Sasha Anderson, 12, a seventh-grade student in Charlotte, North Carolina, correctly picked each Final Four team in this 2017 NCAA tournament in a March Madness bracket organized by her math teacher. Sasha, who said she watches basketball sometimes only because her parents and brothers are fans, picked South Carolina to advance to the Final Four for a personal reason. “I have a special interest because my mom Angela and my Auntie Pam both graduated from the University of South Carolina and my grandparents went there for graduate school,” she told ABC News. Sasha also chose Gonzaga, the University of North Carolina and the University of Oregon to advance to the Final Four by relying on a mix of gut instinct and facts, like looking at each team’s wins. “I thought how much they won would influence the way that they play and proceed to the next round,” she said. Sasha chose Gonzaga because of their regular season record and North Carolina because she shares a home state with the school. Only 657 out of 18,797,085 2017 NCAA tournament brackets, or 0.003 percent, correctly picked North Carolina, Oregon, Gonzaga and South Carolina making it to the Final Four, according to ESPN. Lawson said he was “astonished” by Sasha's bracket. “I had to stop and pause,” said Lawson, who told his students before they chose their brackets that the beauty of March Madness is you don’t have to know everything about basketball to compete. More importantly, according to Lawson, Sasha’s success has her researching the colleges she chose to win. He said that is the point of his March Madness competition. “I want to get the kids used to colleges, used to the names of colleges and just being aware,” he said. Sasha picked Gonzaga and North Carolina to advance to the finals and North Carolina to win it all. She will “absolutely” be watching the upcoming Final Four games alongside her brother and parents. “Of course I will,” she said.